Marathoners are really good at running for long periods of time. Most love the long run, and the grind of putting in mile after mile. But speed work is one of the most important aspects of marathoning and also an aspect that can go overlooked. 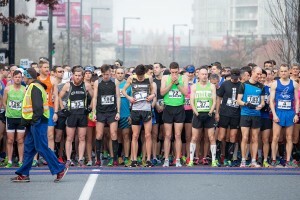 Brittany Moran is a Toronto based chiropractor, marathoner and coach. Moran says that if your goal is to run a personal best in the marathon, speed work has to be part of your training. “Speed training works to improve your overall fitness along with your top end performance. This will benefit your overall marathon performance.” She adds that it’s important to build a strong base before integrating speed work. Below are some of her go-to marathon speed workouts. These are two examples of workouts you can do within a long run. This is a great way to build confidence leading up to a marathon because of the high mileage and high intensity. Do a 10K warm up and follow that with six to ten 1K repeats at marathon pace, taking 1K easy between reps. Then cool down for 2 to 4 kilometres. Start with 16K easy, followed by 8K at your marathon goal pace. Do another 2K easy and then pick it up again for 4K starting at your marathon goal pace and getting faster with each kilometre. Finish with 2K easy. These are more classic examples of speed workouts. Always do 2 to 3K of warm up and cool down before and after getting into the faster stuff. Three to four reps of 2K repeats at tempo pace with two minutes and thirty seconds recovery between reps.
Four to five reps of mile repeats at your 10K pace with two minutes recovery between reps. 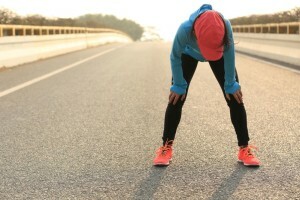 Eight to ten reps of 1K repeats at your 10K pace with two minutes recovery between reps.